Coach, known for its line of top-quality leather handbags and other small leather goods, has several outlets across the country for shoppers looking to spend less for Coach products. Although the Coach products found at the outlets are good quality, they are usually not the top-notch products that you will find at the Coach retail stores, upscale retail specialty stores, and department stores. This is because Coach designs and manufactures products specifically for its outlet stores. Regular Coach shoppers know that finding a Coach handbag marked down in a retail store is nearly impossible. In past years, Coach has forbidden stores carrying the product line from taking markdowns. 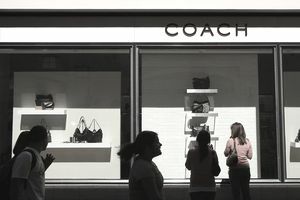 This strategy has allowed Coach to maintain its image and remain an upscale brand, unlike many designer lines that have compromised exclusivity by trying to attract more streamlined customers. By designing Coach products for the factory stores, the company can maintain control over quality and attract the budget shopper who might otherwise buy at auction sites or purchase Coach replicas. What Will You Find at the Coach Outlets? Shoppers looking for specific styles can contact the Coach outlet store nearest to them and give the style information (name/number) to the staff. Ask if the item is in stock, and if it is not, ask if they know if they will be receiving it again. Most of the Coach employees offer good customer service and are trained to use customer contact lists. If the outlet store does have the item, but you are unable to get to the store that day, most Coach outlets allow for the customer to put the merchandise on hold for a day or two. Are All the Products in Outlets Made for Outlets? The majority of Coach products found at the outlet stores have been manufactured specifically for the outlet. However, there are exceptions. Some of the products are shipped from the full-retail Coach boutiques to the outlet division in order to make room for newer products. Shoppers may also find first-quality discontinued and discounted merchandise from previous seasons at the outlet stores. There is a way that shoppers can identify the made-for-outlet products. A small circle is pressed into the creed. The Coach creed is a small square leather patch with the product's serial number embossed on it. It is sewn into the interior of each Coach item. If you see the creed with the circle on it, then you know it is a made-for-outlet item. Coach Factory is on the price tags of the made-for-outlet bags. Merchandise that is shipped from the retail stores will not have Coach Factory on the tags. Coach does not make inferior bags. Strict standards must be met on all the merchandise that Coach produces. Coach will often test a new style at the outlet stores before going into a full production. Is There a Best Time to Go to the Outlet Stores? The Coach outlet stores usually will receive new merchandise at the beginning of each month. The best products sell quickly, so to get the cream of the crop, try to get to the outlet stores during the first week of the month. If you have to travel a good distance to reach the outlet store, call the store first and find out if they have received a new shipment. You may want to delay your trip a few days if the shipment has not yet arrived. To find the seller nearest you, visit the Coach Retail & Outlet Store Locator. You can search for stores in the United States by entering the state name or a zip code. Entering the state will produce a list of all the stores and outlets within that state. Typing in the zip code will reveal the locations of any outlets or, if you want to pay top dollar, stores within 10 to 100 miles (you can adjust the distance) from the zip code. You also can find international locations if you are planning on traveling out of the country.